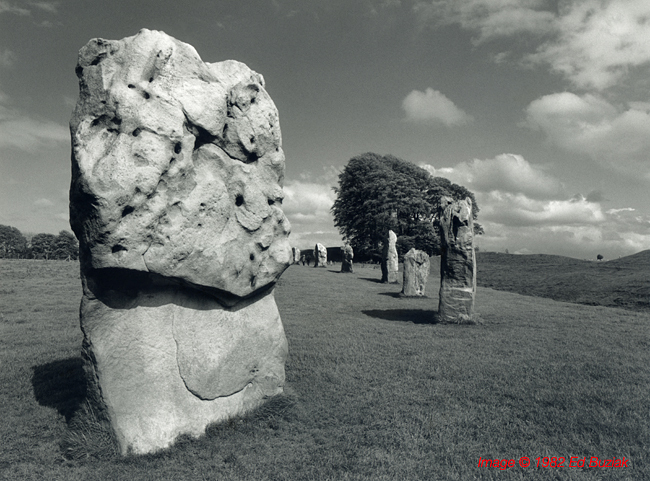 Avebury Stone Circle, Wiltshire taken on llford FP4 film developed in ID-11 at 1+3. The fine grain of this combination has captured the smooth texture of the weathered stone. By chance I met the late Fred Picker of the Zone VI Workshop on one of my many visits there… and I learned how to be respectful by not questioning him too much whilst he was under the dark-cloth creating! Considering there were around two dozen black-and-white film emulsions available at the turn of the millennium from Agfa (alas, by 2005 no more), Fuji, Ilford, Kodak and some smaller specialist-niche European firms… and that they also produce around two dozen different film developers in both powder and liquid forms, is it any wonder that traditional film photographers are continually tempted to try new promising combinations in order to get that something extra out of their equipment and technique for their creative art. The combinations become vastly greater when one factors in the hundred or more commercially available developers available from many niche-producers such as Wolfgang Moersch Photochemie to name just one – although as a very fine photographer and printer he deserves to be high on the list. The good news is that almost every developer will work with nearly every film. The bad news is that it will take a lifetime in the darkroom to try every combination. Sooner or later one realizes that manufacturers know what they are talking about and writing down on those small pieces of paper that come free with their products. They know what works best… if your results do not come up to scratch, there must be something wrong with your technique rather than the manufacturer’s researches, descriptions and recommended instructions. Because there are so many variables in photography it’s best to eliminate as many of them as possible. By constantly changing films and developers more variables are introduced. But finding the right combination and refining it through practice does at least enable you to produce predictable results. Conventional photography is based on silver-gelatin films. The grains of silver salts are relatively small in slow films and larger in faster films. If you make exposures in bright light with slow-speed film you will see a smooth tonal gradation in the processed film. If you make exposures in low light with fast-speed film your results will usually be more grainy. 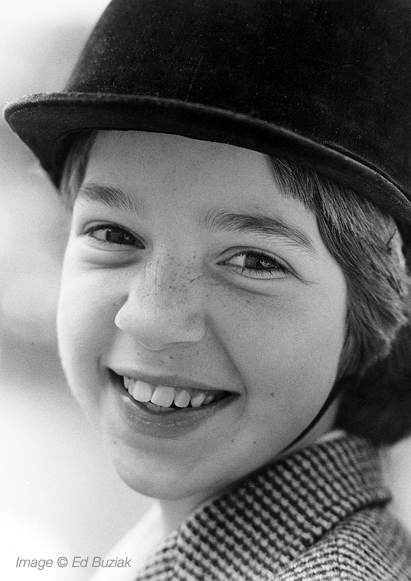 My second daughter - now married with her own family - was taken on Ilford HP5 developed in ID-11 at 1+1, an ideal combination for informal portraits and candids allowing shutter speeds fast enough for hand-held camera work. There are different reasons why grain in a print should or should not be visible. Some photographers and critical viewers dislike seeing it… for others it is the essence of the medium. There are instances when it is valid… and subjects for which it is generally unacceptable. However, you should be practiced enough to produce photographs under extreme conditions of lighting from good to bad, with guaranteed results. That is why it’s advisable to have two good film and developer combinations in your armoury. Two combinations I first used more than a quarter of a century ago were Ilford FP4 in ID-11 diluted 1+1 and the same company’s HP5 (or was it HP4 then?) in ID-11 undiluted stock solution. I have tried many other combinations since then but usually come back to these two basic classics for their known effects and for the results I want. Ilford’s ID-11 has to be mixed-up from a two-part powder pack. I use commercial bottled water (Volvic… always on hand as I drink it a lot) for all powdered developers because it is better than our local filtered tap-water in consistency. Before use I take the “strong edge” off the freshly mixed 2.5 litres of developer by adding a quarter litre of the old developer stock solution to the fresh mixture. Ilford ID-11 developer can be reused with extended development times for each additional throughput of film, or it can be diluted 1+1 to 1+3 and used as a “one-shot” developer… that is, used once and then thrown away. The development times for one-shot use are correspondingly longer, although constant, and there is a plus with a slight increase in sharpness. This is particularly true for FP4, (and especially with the new FP4 Plus)… the extended time with diluted developer resulting in a compensating action, allowing full development of shadows without blocking-up the highlights. Extra care has to be taken with extended development because of the increase in agitation cycles which can over-develop the film. Also, a possible decrease in tank/chemical temperature can result in under-development of the film. Negative testing... the simple method. You should be able to read well-lit magazine text through a properly exposed and developed negative of an 18% Gray Card. There are different recommendations for tank agitation, most of which are too vigorous in many people’s opinions. As long as there is a small airspace in the developing tank, three gentle inversions at the end of each minute is enough for a film to be adequately developed without the developer becoming exhausted. Too much agitation (as well as possible surging through the loaded film spirals) leads to an increase in grain size and contrast. And with too little, the film may be under-developed and possibly streaky. Don’t use a rotary processor for developing fine-grain films; the continuous agitation is generally too vigorous to produce easily printable negatives with most developers… except the tanning developer PMK Pyro which I’ll write about another time. On the other hand, if you want a grainy effect, continuous agitation will help produce it. The difficulty here with modern films is that they are so good their grain is difficult to see. The old Ilford HP3 and HP4 films produced a striking grain pattern when over-exposed and over-developed, but with the recent HP5 Plus emulsion the grain is harder to reveal and print. It’s impossible to duplicate the methods of someone else and expect identical results. The only way to find out what your equipment, materials and methods do is to test them. Don’t do this on an important subject… try it on something easily repeatable such as a shot of your garden or street, or a still-life on the kitchen table. A very simple film speed/development technique is to expose most of a roll of 36-exposure film to various subjects in good lighting conditions. At some point also expose a few frames of the film to an 18% Grey Card… if you don’t have one find either a mid-toned brick wall, area of gray stone, patch of darkish skin, or weathered wood. Make a few exposures of one or more of these objects with the lens out of focus. You are not trying to record detail – just an even mid-tone. 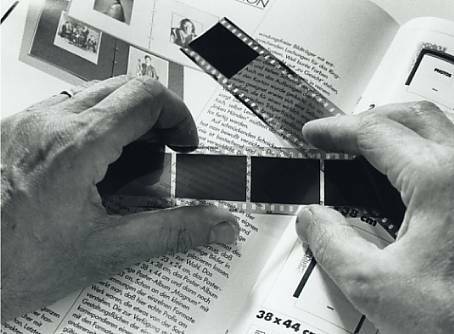 Developing your film according to the manufacturer’s dilution, time and temperature. When dry, you should be able to just read clear black text on white paper, in good light (as above… shot on Agfapan 400 with an Olympus OM4 fitted with a 50mm f/1.2 Zuiko according to the data on the back of the print) of the correct test exposures of the 18% Grey Card or out-of-focus mid-tone subjects. As I said before, you really have to experiment to find your own preference. The important thing is not to search forever using every combination possible. By all means try a few, then concentrate on two. By doing this you will be in greater control and able to repeat the desired effects whenever you want.